The Greatest Road Trip Ever Taken lands today in one of our favorite States of the lot. Montana is The Big Sky State. “Preposterous,” you say! “Absurd,” you aver. “The sky is the same size everywhere,” you sniff. Tell that to the wide-eyed youngster looking in awe at the expanse of sky as the car winds through the lonely stretches of deserted highway. Convince the elderly couple near the Bitterroot Range holding hands on the porch as evening gives way to night. Say it to Meriwether Lewis and William Clark who spent a year crossing Montana when they believed it would take weeks. The sky really is bigger in Montana. The mountains know our names and call them out with the soft melody of the meadowlark singing in a lodgepole pine. Montana is the fourth largest State but has the sixth-fewest people in residence. We aren’t surprised to learn this because the intermountain west is all rural all the time. Spanning a mighty 630 miles west to east, and a not unsubstantial 255 miles north to south, the State easily absorbs the lucky folks who call it home. Statehood was granted to Montana only after a bid for it failed in 1866. Eighteen years later a second Constitutional Convention convened and President Harrison signed the paperwork. Montana is bordered on the west and southwest by Idaho, and on the north by portions of the Canadian Provinces of British Columbia, Alberta, and Saskatchewan. North and South Dakota border Montana on the east. Wyoming provides Montana its southern and southeastern border. The highest point in Montana is Granite Peak at 12,799 feet above sea level and the lowest point in Montana is the Kootenai River. “Lowest point” is relative in the Rockies. 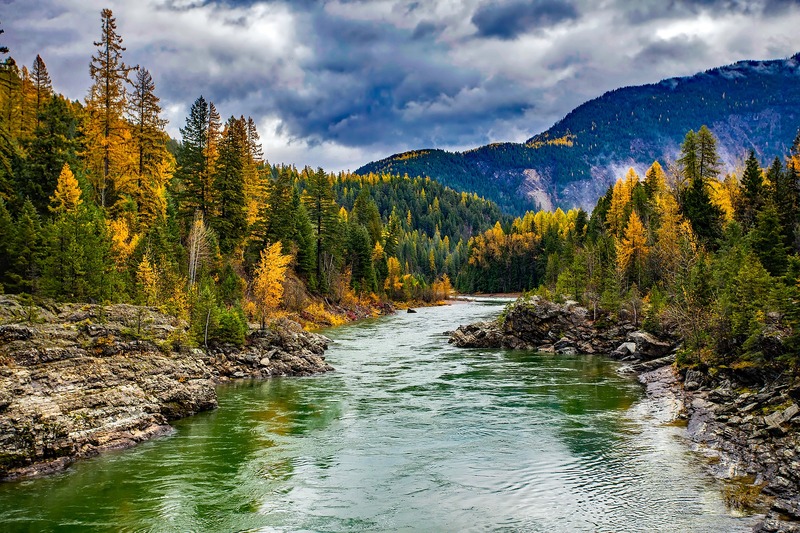 The Kootenai flows at 1,800 feet above sea level. Lewistown, in Fergus County, is the geographic center of Montana. Montana is in the Mountain Time Zone. It recognizes Daylight Savings Time. Missoula International serves about 300,000 customers a year. Seattle and Denver share favorite destination honors. Billings Logan International hosts 400,000 flyers annually. Denver is the top destination. Bozeman Yellowstone International sees almost a half million passengers each year. Denver is the favorite place they fly. Actors: Dirk Benedict, Margaret Qualley, Philip Winchester, Jesse Tyler Ferguson, Paula Rhodes, Haila Stoddard, Constance Towers, Andrea Leeds, Patrick Duffy, Michelle Williams, Dana Carvey, Martha Raye, Gary Cooper, and Myrna Loy. Entertainers: David Lynch, Jeff Ament, Nicolette Larson, Brad Bird, Isaac Brock, and Michael Smuin. Authors: Dorothy Baker, Lesley Ann McDaniel, and Kim Hastings. Athletes: Evel Knievel, Adam Morrison, Tanner Hall, Jess Lockwood, Brock Osweiler, Coby Karl, Ryan Leaf, Phil Jackson, Kroy Biermann, and Jerry Kramer. Montana has the largest herd of migratory elk in the nation. Hill County has the largest County Park in the United States. Beaver Creek Park measures 10 miles long and a mile wide. Let’s Take a Trip Through Montana! Montana is famous for its mountains, but did you know that 60% of the State is actually high plains? (This kind of statistic will show up again when we visit “The Evergreen State” of Washington). It’s true, shortly after passing Bozeman west to east a traveler leaves the mountain ranges behind for pasture lands, oil derricks, and verdant fields. We will visit all the topography Montana has to offer in our trip across its reach. Our trip will be 644 miles long, Even so, hundreds of miles will be left to which we can return another time. Let’s begin in the east, saving some of nature’s most spectacular riches for the end. Just south of Billings we find Pictograph Cave State Park. The Pictograph, Middle, and Ghost Caves were home to generations of prehistoric hunters. A loop trail allows visitors to view the rock paintings still visible in Pictograph Cave. We will begin our visit at the new visitor center. Folks who like to contemplate the lives of those who came before us will find a perfect spot at Pictograph Cave State Park. In 1964, Pictograph’s archaeological significance garnered it a National Historic Landmark designation. It is a unique and extraordinary site because prehistoric hunters who camped in Pictograph Cave left behind artifacts. There are over 100 pictographs and the oldest rock art in the cave is 2,000+ years old. Back on the road, headed for Great Falls. Remember how we marveled at the wide Mississippi River? Recall how we waxed poetic over the wide Shenandoah? Prepare for something completely different, because Great Falls, Montana is home to the world’s shortest river. At least we think it is. There is a dispute between the good folks of Great Falls and the residents of Lincoln City, Oregon. The Roe River, in Great Falls, runs 201 feet from its origin to the mouth. The D River, in Lincoln City, runs 440 feet. So it’s settled, right? Not so fast, my friend. The D River runs into the ocean, and at extreme high tide, the flow covers only 120 feet. The banks of the Roe are an excellent place to dip our feet in the water, have a picnic lunch, and ponder what we have seen today. We’ll be staying in Great Falls tonight. The Great Falls Inn By Riversage is just $71 a night. Good morning, Sunshine. Get up! High in the sky, we go today, and we won’t even get out of the car to do so. Almost to the lovely city of Butte, we will cross the Continental Divide. If during a rain storm, we park our car directly on the Divide we will experience an amazing thing. The rain that falls on the hood will eventually go into the Pacific Ocean. The rain falling on the trunk will eventually, empty into the Atlantic. How cool is that? In Missoula, we will find just the fourth college campus to visit so far. The University of Montana is one of the finest institutions of higher education in the West. Its campus, hard up against that mountain with a block “M” proudly emblazoned on it, is lovely and serene. Eventually, we will be at Glacier National Park, but first a 45 mile (one way) side trip is in order. Down Highway 93 from Missoula find the bucolic little town of Hamilton. Just 4,000 people live in Hamilton, but it is a shopping destination for hundreds of miles to the south and southwest. That’s because it is the end of the populated world until you get 100 miles into Idaho. Hamilton isn’t where Andy Griffith lived. Nor was the show based on this town, but Hamilton has the look and feel of Mayberry. In fact, author Lesley Ann McDaniel based the fictional town of Madison Falls on Hamilton. Many stores close on Sundays. The folks who live here love each other and love to tell visitors about their town. Friday nights in the fall, the stands of Haynes Field are full of fans cheering on the hometown Broncs. We will be having the best burger in town at Nap’s Grill and quench it with huckleberry Pepsi. Fully satisfied we will stay at the Town House Inn for $52 a night. We’re up early the next morning for the 200-mile drive to Glacier National Park. Maybe the most underrated of the National Parks, Glacier has a special place in the hearts of many. Yellowstone has its geysers, and Yosemite has El Capitan, but nothing compares to the raw scenery of Glacier. At Glacier, visitors can experience pristine forests, alpine meadows, rugged mountains, and spectacular lakes. With 700+ miles of trails, Glacier is a hiker’s paradise for either scenery or solitude. G.N.P. encompasses over a million acres and includes parts of two Rocky Mountain ranges. Inside its boundaries are over 130 named lakes, more than 1,000 different species of plants and hundreds of species of animals. This vast pristine ecosystem is the centerpiece of the “Crown of the Continent,” protected land encompassing 16,000 square miles. Two favorites among the many features available are Lake McDonald and the Going to the Sun Road. The lake is so beautiful your teeth will hurt looking at it. And the GTTS Road offers some of the park’s many highlights. We will end our journey, pondering what God wrought, at Glacier Guides Lodge for $170 a night. What a trip it has been through the Big Sky State of Montana.